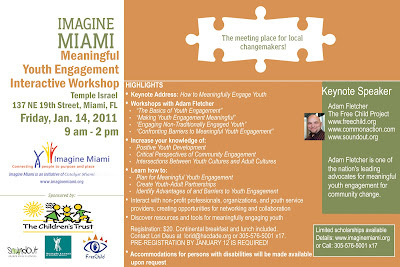 Adam have served as a consultant and trainer for the SoundOut Institute operated by Catalyst Miami, formerly the Human Services Coalition of Miami/Dade County, from 2011-2014. He led the adaptation of the SoundOut Student Voice Curriculum, a 250-page, 26-session, project-driven, hands-on student action curriculum, facilitated train-the-trainer activities for staff, and provided ongoing technical assistance for the program staff. In addition to training facilitators and adult allies, Adam worked with Catalyst Miami staff and school partners focused on successfully infusing student voice in Miami schools.